This site is dedicated to helping honest, law-abiding citizens learn about all of the firearms currently in production, as well as the firearms which are widely available and frequently found on the used market. WhichGun.com has information, specifications, reviews, and photos of hundreds of firearms. 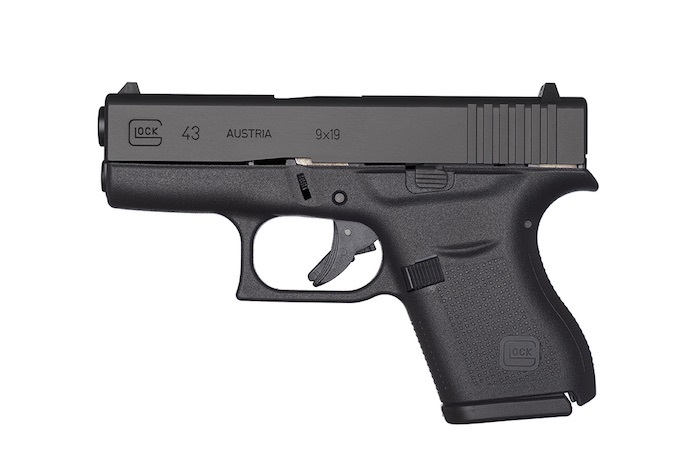 New firearms are added to the site daily. WhichGun.com has been moved to a new webserver. The old server will remain active for several days in order for the DNS (the system which maps domain names to the IP addresses of the servers they are hosted on) to fully update. There should not be any issues, but if you find something is broken or not displaying correctly, please let me know at support@whichgun.com. I know I have fallen behind on keeping the site updated, and as such there are a number of great new firearms which are not listed on the site. Over the next couple of weeks, I will be pouring through firearm manufacturers' current catalogs, and adding any pistols, revolvers, and shotguns which are missing from WhichGun.com. During the update, if there are any specific pistols or revolvers which are missing, and you would like to know how it compares to others with its Concealed Carry Factors™, just send an email to support@whichgun.com with the pistols and revolvers you are interested in, and I will move them to the top of the list to be added. Once the updates to the pistols, revolvers, and shotguns databases are completed, the rifles database is up next. Then we will be up to date with everything, and WhichGun.com will be your best source for firearms information and specifications. It truly will be Your Complete Firearms Buying Guide™. Earlier today, Wayne LaPierre, the CEO and executive vice president of the National Rifle Association, held its first press conference since the tragic Sandy Hook school shooting in Newtown, CT. LaPierre expressed condolences on behalf of the 4 million NRA members, and called for further discussions on how to effectively protect children in what once was the safe haven of their school. He spoke about gun-free zones, and how politicians and the media praise them for being bastions of safety, while in reality they only advertise the safest places for the most insane or evil people to "inflict maximum mayhem with minimum risk". Banks are commonly protected by armed guards, along with airports, power plants, politicians, and sports stadiums, and LaPierre asks why, "when it comes to the most beloved, innocent and vulnerable members of the American family – our children – [do] we as a society leave them utterly defenseless". Instead of guns being the problem, the NRA believes that some of the true sources are violence in the media and entertainment, the widespread demonization of millions of lawful gun owners, and the "dangerous notion that one more gun ban – or one more law imposed on peaceful, lawful people – will protect us where 20,000 others have failed". LaPierre continues, expressing how puzzling it is for the media to assign the human attribute of "evil" to an inanimate object, and in reference to the outcry against the push to use firearms to defend schools, why it seems so difficult for people to grasp "the idea of a gun [being] good when it's used to protect our President or our country or our police, but bad when it's used to protect our children in the schools". He asks everyone to "at least admit it's possible that 26 innocent lives might have been spared" had Adam Lanza been immediately confronted by armed and qualified security. He implored Congress to act immediately to appropriate whatever programs or funding are needed to put armed police officers in every school nationwide, and that this is done before our nation's children return to school in January after the holidays. The NRA is willing, able, and ready to help ensure that this important layer of protection is put into place as quickly as possible. A model National School Shield Emergency Response program – a multi-faceted program that examines everything from building design, access control, armed security, and training for both teachers and students – will be created for any school that wants it. Asa Hutchinson, a former U.S. congressman, former U.S. Attorney for the Western District of Arkansas, and former administrator of the DEA, has been tapped as the head of this effort. LaPierre concludes by calling on everybody to act now and help protect our children by participating in the National School Shield program, and to not allow politics or personal prejudice to divide us. After long delays and the possibility of being scrapped, Magpul is now shipping the XTM Hand Stop Kit. 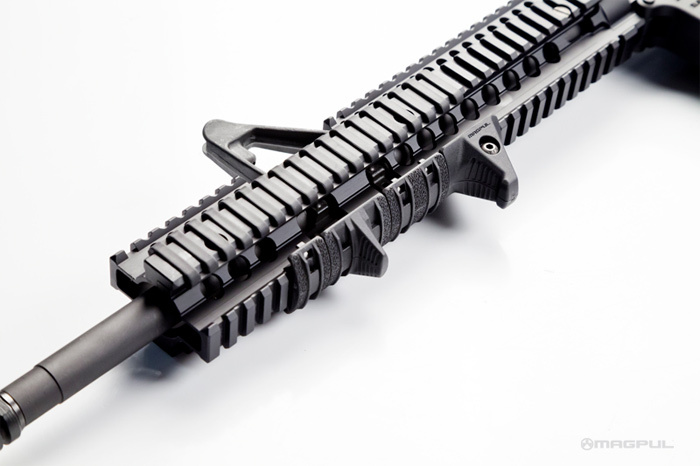 It will mount on any rifle with a bottom-railed handguard. This low-profile device acts as both an index point for improved weapon control and a stop to prevent the support hand from being moved too far forward on the rifle.